When President Donald Trump announced his Advisory Commission on Election Integrity the media nearly lost what was left of their minds. Journalists mocked the idea, dismissing it as an exercise in vanity, insisting Trump was pushing what they freely labeled a lie because he’s upset over having lost the popular vote to Hillary Clinton by 3 million. Yet Democrats are adamant that this commission end, and their fellow Democrats in positions of power in the states resist any cooperation. Their activist arms have gone so far as to file lawsuits to delay sharing voter information with the commission. Not to stop it – it’s public information, after all – but to slow the process in the hope of stopping it altogether. Some have claimed the federal government has no business obtaining the last four digits of voter’s Social Security numbers, which is absurd since the government is the one who issued them. Others have attempted to stoke fears that the Trump administration wants to see how people voted. This is also insane since no ballot is tied to any identifying marks. So why would leftists lie? 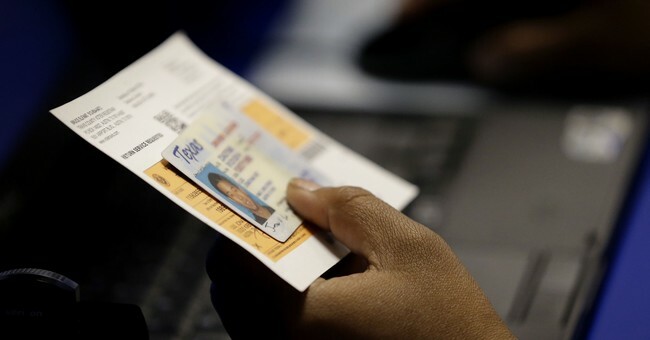 If voter fraud is such a non-existent phenomenon, you’d think these officials and states would be more than happy to prove their voter rolls only contain living American citizens above the age of 18, right? In doing so, they would definitively put to rest the debate over voter fraud, which they could spend the next decade rubbing in the faces of Republicans. Yet they “resist,” if you will. Why? The answers are as old as civilization itself: money and power. The Democratic Party’s base is in an extremely paranoid moment in their history. Years of dividing Americans into tribes based on race, gender, sexual orientation, and every other possible way to segregate humans has led to a collective belief in their supporters that some Republican-led entity is out get them. And there is money to be raised off of fear. A recent Democratic Party fundraising email came with the subject line, “Shut. It. Down,” and was all about the commission. “We knew from the beginning that this commission was nothing more than a way for Trump and the GOP to make it harder for people to vote,” it reads. Of course, the DNC knows there is absolutely no way to know who someone voted for, but they also know a substantial portion of their base is paranoid enough to believe Steve Bannon is reading their emails, so this absurd claim will have appeal to many Democrats. DNC Chairman Tom Perez took it a step further in an op-ed for Time. Of the commission, “(t)here seems to be no limit to how far Republicans will go to disenfranchise certain voters,” Perez wrote. So not only do Republicans want to spy on you, they’re racists too! They know their base, don’t they? In reality, if voter fraud were rarer than a unicorn Democrats would embrace the commission’s work. The data they requested could, once and for all, prove illegal aliens and the dead aren’t voting, that people who vote actually exist. Yet this prospect scares the hell out of them. Weird, right? Of course there is example after example of fraudulent voting. The mainstream media ignores them, pretends they don’t exist, but they’ve very real. They’re generally discovered in small numbers in narrow areas where study of voter data is possible, but if you extrapolate what is discovered narrowly to the rest of the country, there’s a possibility of millions of illegal votes being cast each election. With more and more elections being decided by smaller margins, you’d think both parties would care about voter integrity. And you’d think both parties would consider one fraudulent vote that negates the valid vote of an American to be something worthy of stopping. If you thought that you’d be wrong. Democrats don’t care. For all the chants from their marauding mobs of protests saying, “This is what democracy looks like,” they have no interest in democracy. Which only leaves the question: what are they afraid of?